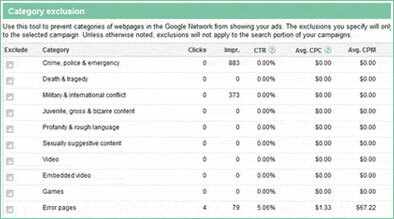 Google recently released a functionality for content-network advertisers. They can now exclude any website in which their ad would appear on the given website below-the-fold. Many advertisers wanted to assurance that their ads were highly visible. In response, Google now offers this so that content-network advertisers can have more control over their ads ad and therefore can increase their campaigns’ performance. Since this filter decreases the number of available websites advertisers can show their ads, bids can consequently be higher than average. Therefore, when using this filter, it is advisable to raise bids. Click the Networks tab and scroll down to the bottom of the page. Click the Exclusions link. You’ll see an “Ad group level” table and a “Campaign level” table. Within the Campaign level, click the Add exclusions drop-down menu, and select Exclude category. Select the “Below the fold” checkbox, and click Save. Conclusion: By allowing the advertisers more control over where their ads appear, they can increase the chances of their ads being views. Ultimately, it can result in a conversion. With Google’s recent functionality in which advertisers can opt out of below-the-fold placement, advertisers are now provided with another way to maximize their exposure on the content network.